one happy little crafter: James - the perfect stocking filler! Hello there, and thank you for visiting today......hope the week is going well, can you believe we're in August already! For some reason, I always get a bit of Christmas card mojo this time of the year, so while I'm on a roll, I'm adding to my box and hopefully saving myself some last minute panic later in the year. This adorable stamp appeared in my Christmas stocking last year, and one of the reason's asked Santa for it was that I though the bedspread would be great fun to paper piece, and I was absolutely right! SO CUTE and pretty colours, love the embossing too. Super cute card with lovely design. Thanks for joining us over at the Winter Wonderland. Lovely card with a cute image, thanks for sharing at Winter Wonderland. 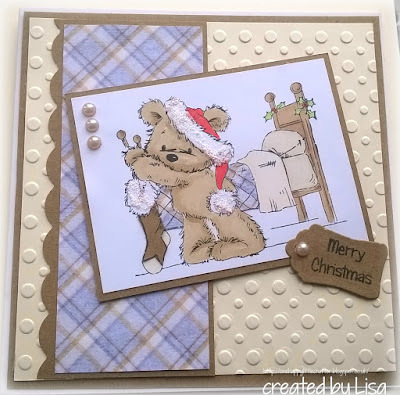 This is just gorgeous - love the colours you used and your colouring is just fab too. Thank you so much for joining in the Di's Digi Designs Challenge and for using one of our digis this time. Hope to see you again. Awww...so cute! Love his checked bedding!